Throughout its history, the Flying Bats has provided women, including large numbers of queer women, the opportunity to play a sport they were historically discouraged from playing. It has also given something equally valuable to many, a sense of being part of a vibrant and supportive community. Sue Kerr remembers that “we also tried to let everybody play regardless of their skills ability until we got to the finals. If we got into the finals, then the team was selected much more based on skill. But it was really about whole lots of people [coming] to the Flying Bats to learn how to play footy. A hell of a lot of them didn’t have a clue. Didn’t know how to stop a ball, didn’t know how to pass with the inside of their foot let alone the outside of their foot.” This welcoming attitude to people with different skill levels continued into the 2000s, with Sabs Cascio laughing as he recounts that "it's more about camaraderie, it's more about bonding over games, over a beer after a game than winning. Because, god, if it was about winning, then i failed." The social environment of the Flying Bats provided many women with a refuge from broader social prejudice and allowed many to form friendships and a sense of community with other queer women. Original player Alison Todd remembers “it was really nice, nice friendships” that grew from the Flying Bats. Involvement with the Club introduced early player, Anne Himmelreich, to other lesbians and made her feel connected to a community. She recalls that “on a personal level, it was a really big thing for me. Because it was similar to me coming out at the same time. So it was wonderful to meet other lesbians rather than just the one or two I knew. It was so important for me. It was just – it was just heavenly to meet all these lesbians and think I’m not the only gay in the village. Which was how it felt going through university, my first uni degree. It was wonderful to meet all these women and think, yeah, we’re a community. It’s not just me and a couple of friends. It was so important for me. It was just wonderful. Absolutely wonderful.” Other interviewees spoke of a sense of belonging and acceptance within the Flying Bats, as well as the lifelong friendships and relationships that emerged from their time with the Club. Source: SYDNEY MORNING HERALD, Thursday 26 June 1997, Page 54 (FULL PAGE). Even from the Club's beginnings, opposing teams and spectators were generally aware that the Flying Bats was predominately a lesbian club. As a result, even though many players were actually seeking a safe and inclusive space to play soccer, Flying Bats members could sometimes be subjected to homophobia. Sue Kerr describes how “there were certain clubs that hated being beaten by lesbians supposedly. So they would take on this whole attitude that would be completely verbal. Mostly it was verbal but there was a whole lot of physical stuff that went on to. Nasty really.” Some contemporary players believe that there is still an element of homophobia that can occur on the field, although this occurs much less than it did previously. One particular incident dealing with responses to homophobia gave rise to a challenging period for the Club. 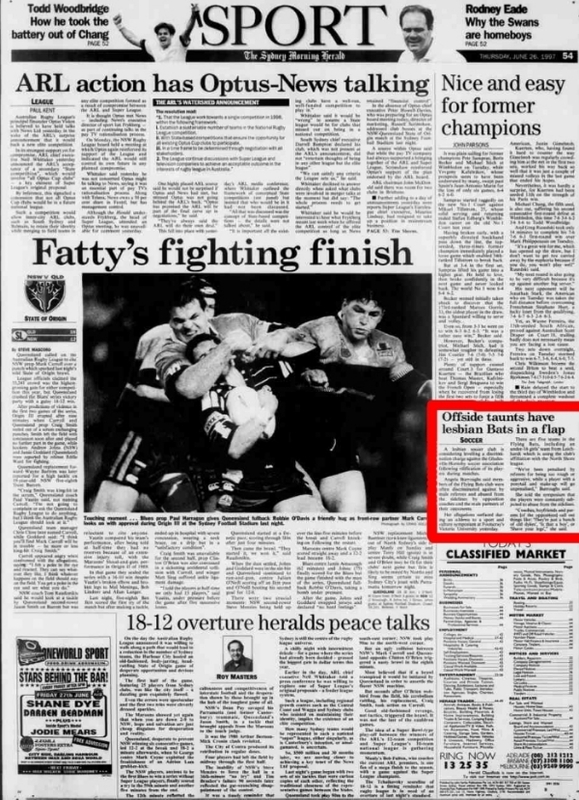 The incident involved the appearance of a news story in the Sydney Morning Herald sports pages in 1997. In the article, a then player of the Club described examples of discrimination at the hands of referees, opposition coaches and spectators. There were concerns at the time that this 'outing of the Club' could lead to negative consequences for players and the Club, especially given the follow up media interest from TV stations. The article led to serious, but productive discussions with the Gladesville-Hornsby Association and precipitated one of the Clubs most significant achievements - developing a formal and inclusive code of conduct that was adopted by the Association. The Flying Bats navigated this period well and matured as a Club in the process. The Flying Bats participated in the Mardi Gras parade for the first time in the mid to late 2000s. The first march was under the Flying Bats banner (pictured). In 2007, 'I love soccer' t-shirts, red sequin bat wings and rainbow socks were worn (pictured). The Bats float tradition continues today, with the Club organising a 'Kicking on strong for 30 years' parade entry in 2015 (pictured). Events have also been important to increasing engagement of potential, current and past players with the Club. Sabs Cascio remembers joining after experiencing Bats camaraderie through friends who played. "I went to a Bats trivia at the Golden Barley, this is quite a while ago now. I just liked the group. The people were funny, inclusive and I like the game, so the following season, I joined up." Perhaps not surprisingly, given the importance of community to many Bats, there have been many relationships formed within the context of the Club. Anne Himmelreich remembers that “there were lots of relationships starting and finishing and things like that.” Some relationships have been long lasting and there are even babies that have come out of Bats relationships. Tina King-Garde asserts "another thing I love about the Bats is how it's changed dynamically - children, there are so many children. It's fabulous, I love it - of all types and kinds of situations." Photo: FLYING BATS. COACHING OUTREACH FLYERS. Similarly, Ellen Scott, who plays and coaches, speaks of her happiness at seeing women who had never played before learning skills and enjoying the game. "I was amazed at how quickly they started playing the game and developing and understanding what they were doing. It was quite rewarding to see that. Even more so that they were enjoying it." PHOTO: PHIL GARDE supporting the bats AT A GAME on 30 APRIL 2006. Supporters have also done much to promote the culture of the Club. One of the Club's longest participating players, Tina King-Garde, had a husband, Phil, who was a keen supporter of the Flying Bats. The Bats in turn welcomed this support with open arms. Tina recalls "this club embraced him to the point where they bought him his own t-shirt, they bought him his own flags. He took this role very seriously for a couple of years until he couldn't do it anymore." When Phil passed away, the Club named the Club supporters award after him.